In what is going to become a recurring post by several individuals, I’m going to share a brand new Geek Recipe! I swear they won’t all be alcoholic drinks…or maybe they will. Hell if I know. After all, I do drunk tweet with Mike from MikeLovesBeer.com. The following recipe completely struck me by pure dumb luck while at a recent outing at the grocery store. The drink earns it’s name in that is strong, made with Naked juice, and you will more than likely attempt to smash something after consuming a couple. -2 Shots of KRAKEN brand rum. My personal favorite, but Sailor Jerry or Captain Morgan 100 proof will suffice as well. 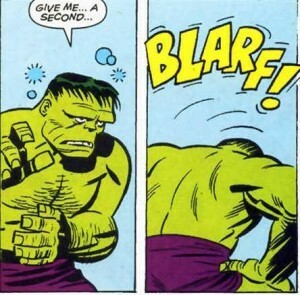 It must be HULK STRONG! -Fill the glass just below the lip with Naked brand “Green Machine” juice. It’s a mixture of Apple, banana, a touch of pineapple, kiwi and mango. Being that it is a dark, spiced rum you’re probably using and an all natural juice the sugar content is going to be pretty high. So if you’re dieting or sensitive to sugar, you’ll probably want to pass. 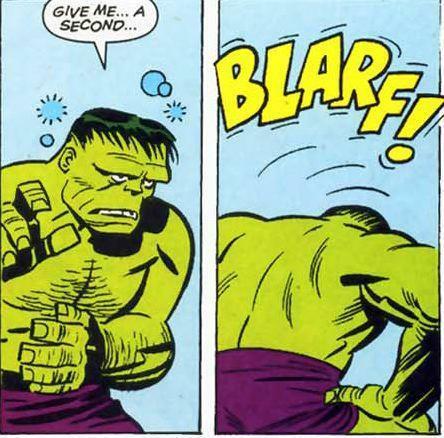 If not you may wind up taking a big Hulk sized puke on your kitchen floor!